Could Machine Guns Become Totally Legal? Despite President Obama’s new executive orders, the gun lobby is still playing offense. Given that a hypothetical American, who is underage, has been convicted of a gun crime, has restraining orders out against him, and is on a terror watchlist could go online and have an assault rifle shipped to his door without incident, the US gun lobby seems to have its work cut out for it: simply blocking any action in Congress will perpetuate this madness. President Obama issued executive orders Tuesday in an attempt to bypass this legislative stasis. The biggest piece is expanding the number of small private dealers who must obtain licenses to sell guns and then must perform background checks. He will also send more money to agencies conducting the background checks, increase mental-health funding, and make it easier for states to send mental-health information into the background-check system. Federal agencies will also fund more research into making guns safer. These efforts have been widely praised by gun-control groups, and are probably the outer limit of what Obama can hope to achieve on guns while he is president. He doesn’t claim the changes will solve the country’s gun problem, and they won’t: They will mainly nibble at the edges. It may be harder to buy a gun from a private seller online, but it will remain far from impossible. Obama likely knows, however, that he’s facing an increasingly serious situation. The gun lobby isn’t content to simply play defense, but has pressed a completely unashamed effort in courts and state legislatures across the country to further weaken America’s already anemic gun laws. Would it be crazy in a country already seeing a spike in mass killings, many of them conducted with semi-automatic assault weapons, to allow fully automatic machines guns to flood the streets? Yes, but that’s the aim of dueling court cases working their way up the federal judiciary at the moment. In both Hollis vs. Lynch and Watson vs. Lynch, the plaintiffs are mounting an innovative challenge to federal laws that since 1986 have prohibited anyone from manufacturing fully automatic machine guns. (There are a relatively small number of pre-1986 machine guns still in existence, which one could obtain right now after a background check and an agreement to be monitored by federal authorities). * Working in tandem, Ryan Watson of Pennsylvania and Jay Lynch of Texas both applied to the Bureau of Alcohol, Tobacco, Firearms, and Explosives for permits to manufacture fully automatic machine guns. Both men made the application under the auspices of individual, unincorporated trusts. Their argument was simple: While the 1986 Gun Control Act forbids “persons” from possessing machine guns, Hollis and Lynch argued that the definition applied to actual people, corporations, or partnerships—but not trusts. The ATF actually approved both applications, before declaring them a mistake almost immediately and subsequently revoking the approval. The two men mounted immediate court challenges, and made dueling claims: one, that unincorporated trusts should be allowed to legally manufacture machine guns, but also more broadly, that laws against machines guns passed in 1986 are fundamentally unconstitutional breaches of the individual right to bear arms. These concurrent challenges were no coincidence—they are both receiving financial backing and coordination from an array of pro-gun groups, including the Gun Owners of America, a group considered even more extreme than the National Rifle Association, and some of the same pro-gun groups who engineered the landmark Supreme Court decision in United States vs Heller that clarified an individual’s right to bear arms. 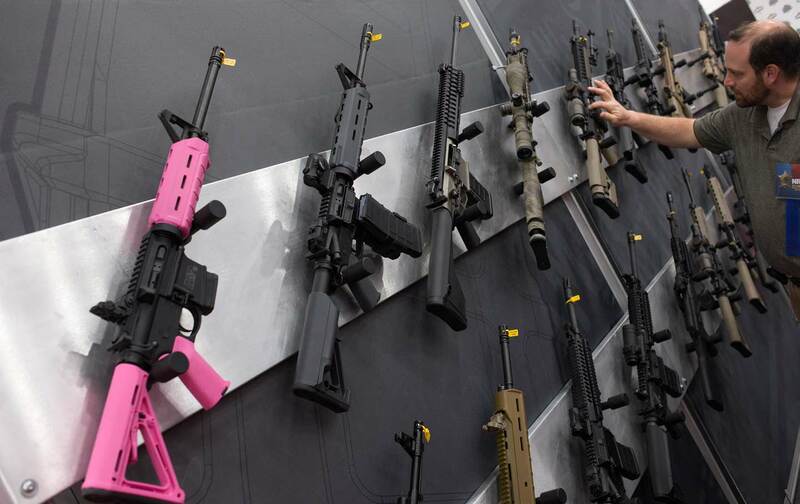 Neither case has so far been successful in a federal court, but these pro-gun groups have supplied money to keep the appeals going, and both cases are now at the federal appellate level. If the more narrow question of trusts owning machine guns is decided favorably for the plaintiffs, it’s possible people might be able to pay a few thousand dollars to a lawyer, form a trust, and manufacture machine guns—though Obama’s recent executive actions incidentally attempt to tighten the ATF definition of persons to include trusts, because people have also been forming trusts in order to transfer weapons with a mandated background check. It’s not yet clear how that would affect the claims in Hollis and Lynch. The case is a bit of a long shot: To succeed, it would probably have to reach the Supreme Court, and then find five justices willing to make some new law as to what is, and is not, a bearable arm. There is some unsettled law in Heller as it relates to machine guns, McLively said, though he isn’t too worried the courts will actually find them permissible. “The court didn’t come out and say that machine guns are outside scope of Second Amendment [in Heller], but they telegraphed that outcome,” he said. Still, you can see why this is a shot worth taking for gun groups. There is a potential legal opening to exploit, and it can be done largely out of public view—while a congressional push to legalize machine guns would no doubt be met extremely poorly, this effort requires no voting and is being done largely out of public view. And it’s far from the only challenge: McLively said his group has tracked over one-thousand Second Amendment challenges since the Heller decision in 2008, 94 percent of which have been unsuccessful. But with persistence and a seemingly unlimited amount of money, gun groups can keep chipping away. The most dangerous cases involve whether the Second Amendment’s right to bear arms, elucidated in Heller, extends outside the home. Most courts have ruled that it applies only to conduct in the home, and thus various local restrictions on concealed or open-carry permits have been upheld. But two federal appeals courts have found the Second Amendment applies or likely applies outside the home—findings that, if cemented by the Supreme Court, could wash away a number of existing state restrictions on firearm possession in public places. That would be unfortunate for the many states trying to keep some gun restrictions in place—but there are many others going in the opposite direction. Texas’s open-carry law just went into effect, meaning permitted citizens can have a gun strapped to their belt as they grocery shop or pick up their child from daycare. In fact, as The New York Times recently noted, the Texas legislature has a no-wait security line for people carrying licensed guns, while everyone else has to go through metal detectors. And Texas isn’t alone in its absurdity. In 2015, Arkansas passed a law explicitly allowing guns in a locked car on the premises of K-12 schools and colleges, and Oklahoma allowed K-12 employees to carry guns at school functions. Florida said it was okay for everyone to carry unlicensed weapons in a declared state of emergency. Idaho permitted unlicensed firearms outside the limits of any city. (There are not many cities in Idaho.) Tennessee created concealed-carry permits that would last for a person’s lifetime. All the while, American appetites for guns is growing. In December, after a string of mass shootings capped off by the carnage in San Bernadino, California, gun sales reached a post–Sandy Hook high point. Obama’s executive actions are creating some much-needed momentum in the opposite direction, but make no mistake—he’s swimming against an extremely strong current. *This article has been updated to reflect that ownership of pre-1986 machine guns is legal.